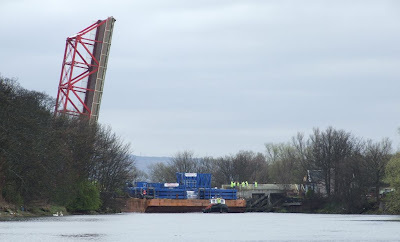 The road bridge across the River Cart was opened this morning to allow the Stemat barge that arrived on 9 April to bring its cargo downstream. It had been moved from Rothesay Dock to the Babcock Basin just upstream of the bridge early on Monday morning. Towage was provided by two of the Offshore Workboats fleet, the tug TRIO at the head of the tow with BARROW SAND assisting aft. OWL are based at the River Clyde Boatyard in Rothesay Dock. The barge's cargo, fabrications built for Parkburn Precision Handling Systems by Steel Engineering Ltd, are destined for a Dutch cable-laying barge. Once the load has been secured for sea, the barge will leave Rothesay Dock. Well done,I waited a few hours last week.....Still find it hard that its safe to sail up the cart. Thanks for the pictures. My brother works in Steel Engineering Ltd and he had been telling me about it so it was nice to see some pictures.